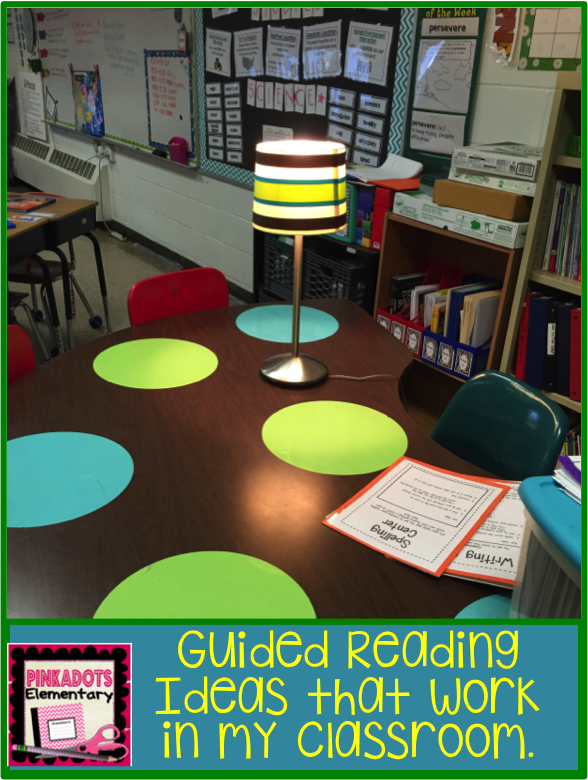 Pinkadots Elementary : Three Strategies to Implement in a Guided Reading Group Using Any Text! Bonus Freebie Included! So it's been a while since I've blogged and I've been feeling SO guilty. There is nothing I'd like to do better than to sit down and create a blog post, but unfortunately, life has been getting in the way. Report cards went home last week, conferences were last week, our goal setting meetings were last week and this week I can FINALLY breathe! Anyways...our school is diving head first into guided reading this year and the number one question all teachers had was, “What are the ‘other students’ doing while I have a small group?” Once I started thinking about it, centers were the way to go for my classroom. I implemented this idea a few weeks ago and it has been working out fantastic. It is a great way for the students to learn responsibility, collaboration, independence, and skill building. I have so much to share about guided reading, so this will be PART 1 of many posts on the topic! While I am meeting with my small group we are focusing mainly on reading strategies to help with comprehension. 1) Summarizing: This has been a difficult skill for most of my fourth graders to grasp and continued practice on this topic (fiction and nonfiction) is always needed. 2) Fluency: Believe it or not, my students can never get too much fluency practice. Repeat reading of paragraphs during small group time is a great way to focus on speed, expression, accuracy, and punctuation. I sometimes even time the students for a cold read and count the number of words read correctly in one minute. After practicing the paragraph throughout the week, they then read it again and get a new number count. Charting this on a bar graph is an amazing motivator for all students. 3) Sequencing: With some of my friends, we use sticky notes to write out the most important events from fictional stories. We then practice retelling the story mentioning all of the post-it notes. We use the notes as a resource to manipulate and start writing a summary. If the book is nonfiction, sequencing the growth, development, or timeline of the event/animal is always another great idea. 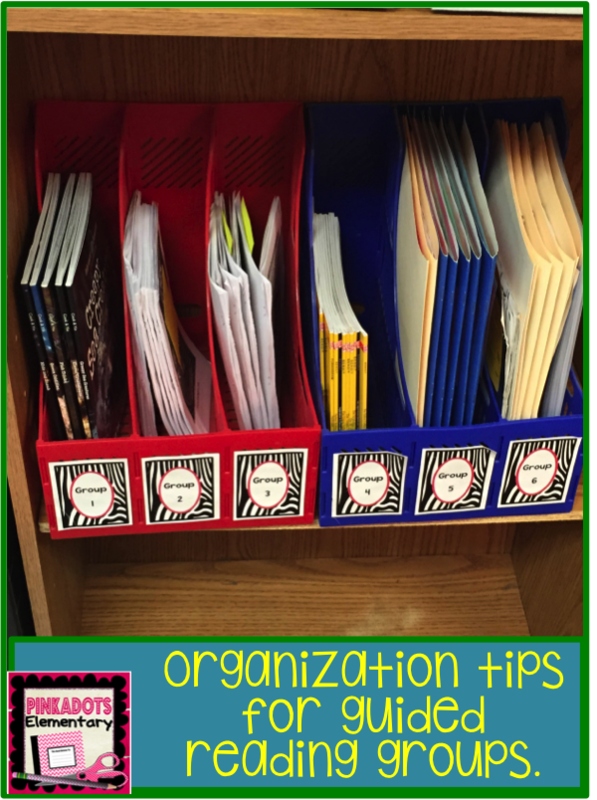 How do you stay organized with so many groups? This might be something you struggle with (like me, up until a few weeks ago). It really isn't that hard. One idea is to have a select space for each group's materials. I use magazine holders for each group. The students know where to get their books and where to put them back. Another tip for organization is to be prepared. Have something for everyone, not just the students in your group. The work should be engaging and meaningful, not just a filler. Check out my center rotation list to see where the students go. This is an organized way to answer the constant question of, "What are the other students doing?" Since the groups are fluid and always changing based on reading abilities and/or student interest, the students’ nametags have the number of their current group. As soon as my students enter the classroom in the morning, they know to look at the center list to see what they will be doing for a morning activity. I used Velcro to attach the groups to the bulletin board. This allowed for quick and easy moving. I have centers set up for Guided Reading (meet with the teacher), Wow Words (Vocabulary building through independent reading), Spelling Center (Spelling words used on a choice menu), Writing Center (Responding to daily prompts), Listening Center (Audio chapter book while students follow along), Task Cards (Constantly changing based on student needs), and Seat Work (Work for the lesson of the day). Most of the materials for each center can be customized to the current unit or curriculum. I also like to give students a choice of what they work on in the center, so I use menus or choice boards related to the activity. The information at the centers are usually created by me and for my students. 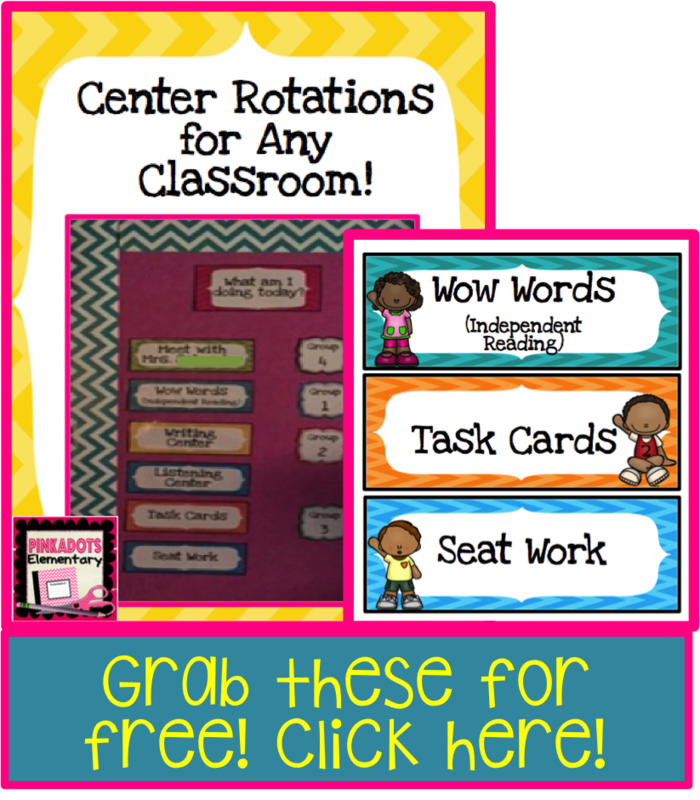 Check back for another post on what is in each center, but for now, grab your free copy of the center rotation list! Enjoy! How long do you have for your reading block? Do you meet with a group every day? I love your organization system!